Home to the iconic Taj Mahal, Uttar Pradesh (UP) is a state that holds monumental importance in the history of our country. Neighbour to the national capital, New Delhi, UP has more than just magnificent buildings. Its capital city Lucknow and its industrial capital Noida are among the most populous cities in India in addition to the holy city of Varanasi and the tech capital Kanpur. Every year, multitudes of people migrate to UP in search of culture, education and opportunities. This naturally leads to an increased demand for rental spaces within the city. 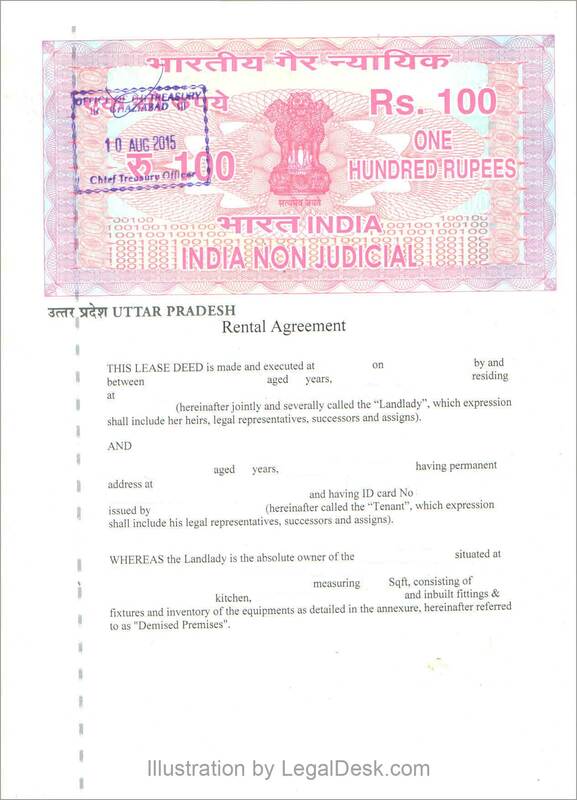 If you are on the lookout for a rental space in UP, and in need of rental agreement, this page is a must read. You can also create rental agreements online without having to experience the hassles of having to look for a lawyer. 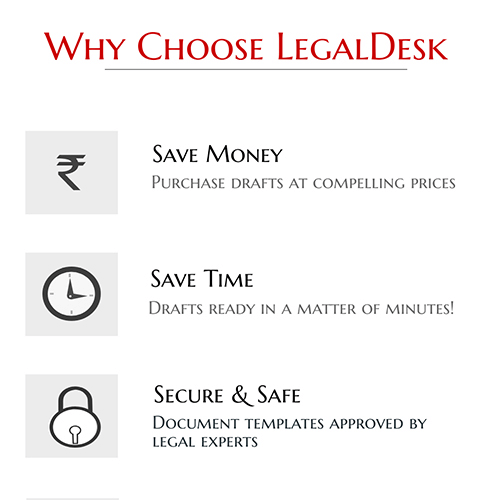 LegalDesk offers excellent pre-drafted, lawyer verified, ready-to-use rental agreements which can be customized to suit your needs. Stamp Duty is tax paid in return for making a legal document valid. In UP, Stamp Duty charges for rental agreements are 4% of annual rent + deposit, if term of lease is less than a year. If requisite Stamp Duty is not paid, should any dispute arise, the court may sentence you to pay ten times the original Stamp Duty as penalty. In UP, 2% of the rent+deposit charges is the registration charge. If a document is not registered, it will never be considered as primary evidence. Instead, it will be accepted as collateral evidence. Aadhar card or the receipt received while applying for it, if the person is Indian. If the person is not an Indian, then his/her original passport must be presented. E-Stamping in UP was introduced in early 2013, initially being available only to folks who paid stamp duty of INR 10,000 or more. As of now SHCIL along with select banks, is regulating the issue of e-Stamp Paper in the main cities of UP. Notarization is not registration and must not be confused with each other. Notarization is simply a method for fraud-deterrent and to prove that the document was indeed signed by the parties discussed in the contract. Non notarized agreement will only be considered as collateral evidence in courts should disputes arise. Also called Caution Deposit, is also a lump sum collected from the Tenant prior to moving in. This amount is essentially backup for damages incurred by the Tenant for which he/she refuses to pay or for non payment of rent. Should no hassles occur, the security deposit is fully refundable to the Tenant at the time of handing back the keys. 11-Month Tenancy Deed – This is the most commonly used rental agreement used predominantly for residential purposes. The duration of the contract is 11 months as the name suggests and can be renewed at the end of term. Such deeds are rarely registered or notarized although it is a wise choice. Commercial Lease – Signed almost exclusively for businesses carried out for profit, commercial leases often involve large sums of money and clauses specific to individual businesses. Hence, they rarely follow a standard format. They are usually registered and notarized to avoid future hassles. Long Term Lease – Are signed for both residential and commercial purposes. They involve upfront payment of large sums of money and the duration of such contracts is always more than a year. The amount paid upfront is often paid back to the Tenant at the end of term, without any interest and after deducting compensation for damages/maintenance. In such contracts, the utility bills are to be paid on a monthly basis by the tenant. Notarization and registration are rarely overlooked in the case of such leases. Often it is seen that most people prepare a rather careless rental agreement with plenty of loopholes because they are simply not aware of the troubles that could follow. Majority of people are unaware that a badly drafted agreement could make things ugly if a dispute arises in future. Monthly rent, security deposit & maintenance charges – The amounts for each are to be discussed in advance and written down clearly in the contract. Food habits – Landlords partial to vegetarian tenants, must make it clear before the contract is signed and so this clause should never be omitted. Animals – Permission to keep animals within the premises must be granted through the contract. If there is no such clause, the tenant is free to do as he pleases on this matter. Overstay – The consequences of overstay, a situation where the tenant continues to occupy the premises even after the contract has ended, must be discussed in the deed. Penalty for late payments – When the tenant does not pay rent regularly, the landlord is free to impose a penalty on the tenant. Such a penalty must be spelled out in the contract. Lock in period – This refers to the minimum duration for which the contract cannot be terminated. Include a lock in period clause to prevent either party from backing out. Owner’s authenticity – The person posing as the owner could in reality be a caretaker or even a tenant who is subletting the premises to you. Always ask for proof of ownership and receipts of tax/electricity bills etc. Payment receipts – Always, we repeat, always collect receipts for every payment you make. Painting and maintenance – Most landlords get the property freshly painted before the tenant moves in. In reciprocation, the charges for painting are deduced from the security deposit. However, if the house was not painted before the tenant moved in, the landlord has no right to deduct money for the same. Registering the document – Many overlook this step assuming that nothing can go wrong. However, if a dispute arises, an unregistered deed will only serve as collateral evidence in Courts. To create a rental agreement with LegalDesk, fill in your details in our pre-drafted, customizable, lawyer verified rental agreement which can be accessed by clicking the button below. Fill in details of all parties involved and details of the property intended for leasing. Review and print the prepared soft copy on Stamp Paper or you can allow us to print the document on Stamp Paper and deliver to you.